Cathryn J. Prince - Burn the Town & Sack the Banks: Confederates Attack Vermont! On a dreary October afternoon, bands of Confederate raiders held up the three banks in St. Albans. With guns drawn, they herded the townspeople out into the common, sending the people of the North into panic. Operating out of a Confederate stronghold in Canada, the raiders were young men, mostly escapees from Union prison camps, who had been recruited to inaugurate a new kind of guerilla war along the Yankees’ unprotected border. The raid, though bungling at times, was successful — the consequent pursuit of the rebels into Canada. The celebrity-like trial it sparked in Montreal and resulting diplomatic tensions that arose between the U.S., Canada, and Great Britain, left the Southern dream of a second-front diversion in ruins. What survived, however, is a fascinating tale of the South’s desperate attempt to reverse the course of the war. 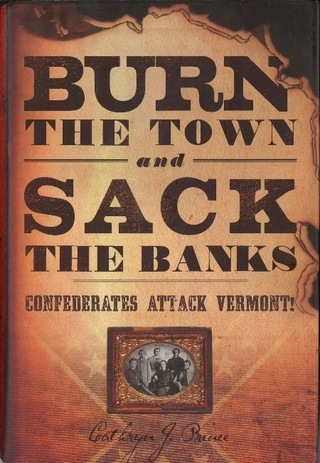 Burn the Town and Sack the Banks is a tale filled with dashing soldiers, spies, posses, bumbling plans, smitten locals, lawyers, diplomats, and an idyllic Vermont town, set against the backdrop of the great battles far from the Northern border that were bringing the Civil War to its bloody conclusion.